dolphin diving and playing with its buddies or casting a hook out for a random "catch of the day"! In this area, we have brackish water, so you never know what you are going to pull out at the end of your line! The other day, my son caught an eel, a catfish and several blue crabs. 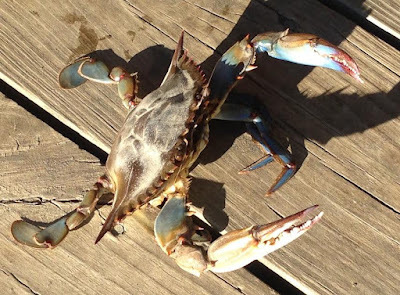 Catching blue crabs one at a time, rather than in a crab trap, certainly makes one appreciate that bowl of She Crab soup from 82 Queen or Magnolias! If you would like more information about living or relocating to Charleston, SC, let me know! We have more than enough fish in the sea and would love to share! Charleston Farmer’s Market: Don't Forget Your Grocery List! This past weekend, we could not have asked for more perfect weather in Charleston. Temps hovered in the low 70’s, skies were blue and a gentle breeze completed the remarkable conditions. On weekends when we don’t have ballgames, activities or work calling us to other places, we love to head downtown to Marion Square to the farmer’s market. If you have never been to the farmer’s market in downtown Charleston, you owe it to yourself to go and spend a few hours with the locals and try some of their goods! Now don’t confuse this with the Charleston City Market. That is the market on Meeting Street that is one of the oldest public open-air markets, and one of Charleston’s #1 tourist attractions. The Charleston Farmer’s Market is a few blocks away in Marion Square, on the corner of Calhoun and King Street. Although you will find some of the same vendors at both markets, the majority are different. At the Farmer’s Market, you will find more local farmers, food vendors and artisans. http://www.charlestonfarmersmarket.com. Shopping for my weekly produce at the Market is a real treat. The vendors are proud of their offerings, and their humble and genuine appreciation and friendliness is what I love about the place. (Not just this market, but Charleston, in general!) I love to chat with my favorite farmer as he rings up my weekly veggies, moving them off the scale and into the bag, secretly slipping a few extras with a wink! Although there are many farm stands throughout the square, I like to make the extra walk to the back to my favorite! Before I work my way to the back, however, I have a favorite stop along the way to get some of the most amazing okra I have ever had! What has now become my favorite veggie to grill, the red okra comes out of the garden RED, but turns green as you cook it. I just slice it lengthwise, toss it with olive oil and some of my favorite seasonings (also found at the market in another booth). A few minutes on the grill? Oh my! Give it a try. You can thank me later!